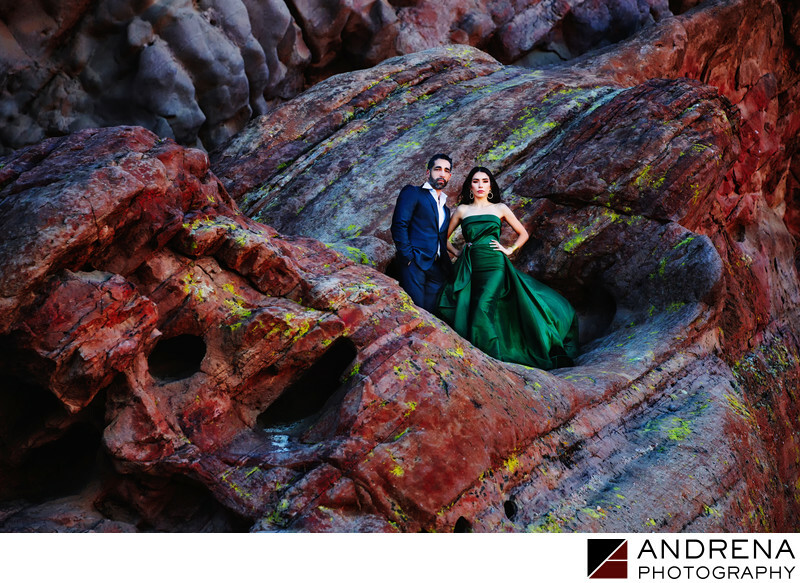 Stunning backdrops and beautiful wardrobe are the key to pre-wedding photos looking dramatic and stylish, as was the case with this Vasquez Rocks engagement session. When working in a natural environment location, you may face high winds, dust and dirt, so it is always helpful to bring a brush, lipstick, powder, a mirror and blotting paper. For this photo, I used numerous Photoshop techniques to bring out the color in the rocks, which is not immediately apparent to the eye when working at the location. Understanding what a photo can be, and then making the photo into my vision in post-production, is one of my favorite things to do. I love working with couples who really go all-out with wardrobe and who truly value photography. For this photo, high winds proved to be our friend, as they served as a wind machine that blew the bride's ballgown out behind her and kept her hair looking high fashion.